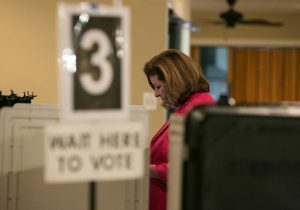 ROSWELL, Ga.— Republican Karen Handel made a point of contrasting her eligibility to vote in Georgia's special election with Democrat Jon Ossoff as she arrived to cast her vote on Tuesday morning. "I bet [Jon Ossoff] wishes he could vote like me, since I live in the district," Handel said when she arrived at the polls, in reference to the fact that Ossoff lives just over three miles outside of Georgia's Sixth Congressional District. "This election is about the voters—the people that can come out and vote today," Handel told reporters after casting her vote. "Make sure you get that ‘I Voted' sticker, the other team won't have one." Handel has made her status as a local member of the community a main theme of the race in its final days, as a way to contrast herself with Ossoff. "This race is not about what's going on in the rest of the country, it's about you and the people of the sixth district," Handel said during her campaign's final rally on Monday night. "There is a fundamental difference between my opponent and me—it starts with the fact that I have lived in this community for nearly 25 years." Handel, who was chairman of the Fulton County Board of Commissioners before becoming Georgia's secretary of state, touted her experience in doing the things that Ossoff says he would do if elected. "My opponent talks about what he wants to do, I've actually done it," Handel said. "He talks about working across the aisle—y'all know the Fulton county commission, nothing would have gotten done if I hadn’t gotten good at working across the aisle to do what was best for you." Handel also poked fun at Ossoff's experience working as a "junior staffer for Hank ‘Don't Let Guam Tip Over' Johnson," a reference to Ossoff's work for a congressman who once stated his fear that the U.S. island may literally tip over. Ossoff has taken heat in the final weeks of the campaign not only for living outside the district, but also for the fact that nearly 97 percent of his contributions have come from sources outside of Georgia. President Donald Trump sent out messages on both Monday and Tuesday pointing out Ossoff's inability to vote in his own election. The critique from Handel's supporting cast at Monday night's rally, which included Georgia governor Nathan Deal (R.), Rep. Doug Collins (R., Ga.), and Jere Wood, the longtime mayor of Handel's hometown, Roswell, Ga., followed a similar theme, highlighting Handel as an experienced local. "They have tried to make this a national election, but it's a local election that is going to be won by local people," said Wood. Handel spent her Monday morning giving a tour of the district to House Majority Leader Kevin McCarthy (R., Calif.), who praised Handel's local background and said that he has known her for a long time, coming down to the district with its former representative Tom Price. Ossoff also made his closing argument in Roswell on Monday night. The Washington Free Beacon was barred from attending the event. Polling indicates that Handel and Ossoff are currently running neck-and-neck. Results likely won't be known until late Tuesday night.